At HTUK we design and supply electric trace heating systems and temperature controlled applications. Trace heating cables and silicon heater mats can be designed for residential, commercial and industrial applications such as pipework, storage tanks/vessels, hoppers, scientific equipment, catering equipment, underfloor heating, transportation and many more. Trace Heating (or Heat Tracing, or Surface Heating) is the method of applying heat to a body, or to a product (liquid, powder, or gas) contained within a system (pipework, vessel or equipment) for storage or transportation, in order to avoid processing problems or difficulties. The main types of heating are Freeze protection, Process Maintenance and Raise and Maintain and the above heating types are used to provide any one of the three main applications above. The purpose of the heat tracing is to keep the pipe or equipment above the freezing point of the product you are protecting. The purpose of this type of application is to keep the equipment at an elevated temperature, normally above the 5°C threshold mentioned above. In this application, the product needs to be brought up from a start temperature up to a desired final temperature over a specified period of time. Electric heat tracing is governed by a number of International and National Standards covering Industrial (Safe) and Industrial (Hazardous) locations. 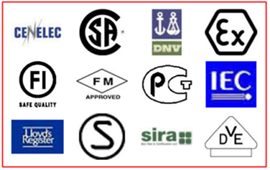 A list of the most important standards, to which many of our products are approved, are shown in the table below. In addition to the base design review we provide all drawings and documentation required. • IEC62395 – for Safe Industrial locations and IEC60079-30 for Hazardous locations. • Zone 0 may have explosive gas-air mixtures present continuously or for long periods. Heat tracing is rarely, if ever, used in Zone 0 areas. • Zone 1 may have explosive gas-air mixtures present in normal operation. • Zone 2 may have explosive gas-air mixtures present only under abnormal conditions. • IIA – Acetone, benzene, butane, ethane, methane, propane, etc. • IIB - Ethylene, town gas etc. As non-sparking devices, most heaters are likely to be approved to the concept ‘e’ – increased safety (EExe). Sparking devices such as thermostats or circuit breakers are most commonly approved to the concept ‘d’ – flameproof (EExd), although concepts ‘i’ – intrinsic safety (EExi), and ‘p’ – pressurised apparatus (EExp) are also sometimes appropriate. Sometimes, distribution boards and control panels can be located outside the hazardous area to avoid the need for the additional costly protection. All pipes/equipment that are above the ambient temperature will experience heat loss. Heat loss is the loss of heat to the environment. If no heating is applied to the pipe/equipment it will eventually equal the ambient temperature, at which point the heat loss will be zero. The heat loss can be delayed by the application of thermal insulation. However, over a period of time, without heating the equipment will eventually match that of the ambient. To keep equipment above the ambient, it is essential to add heatingand insulationto offset the heat loss. The above calculation is based on Fourier's Law for heat loss.